Several months ago while looking for old-fashioned blogs, I came across a new-to-me but long-time blogger who wrote about the idea that you must choose your propaganda. 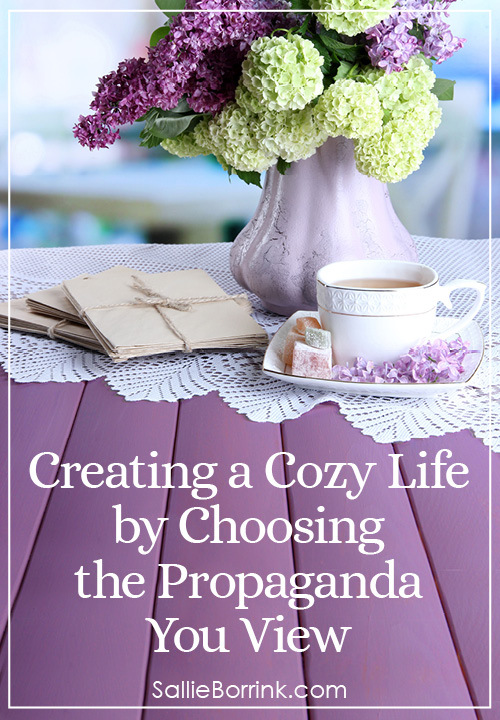 (Mrs. White also wrote another post about homemaking propaganda.) 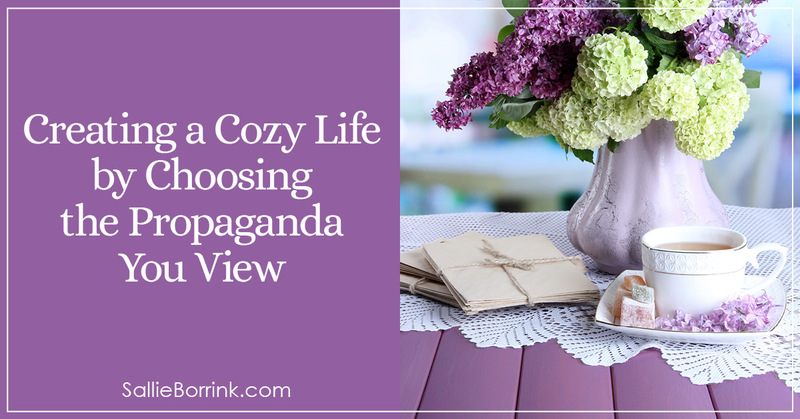 I’ve thought about the concept of propaganda in the various parts of my life since then – as a woman, as a Christian, as a wife, as a mother, as a homeschooler, as a homemaker, etc. I also read The Benedict Option that provided much food for thought regarding how to interact (or not) with the broader culture which is in decline in numerous ways. I’ve thought about propaganda and culture even more the past few months since I started thinking seriously about leaving Facebook and then left Facebook for good. Propaganda is everywhere and it has tremendous power for good or bad in our daily lives. Propaganda is information that is not objective and is used primarily to influence an audience and further an agenda, often by presenting facts selectively to encourage a particular synthesis or perception, or using loaded language to produce an emotional rather than a rational response to the information that is presented. Propaganda is often associated with material prepared by governments, but activist groups, companies and the media can also produce propaganda. In the twentieth century, the term propaganda has been associated with a manipulative approach, but propaganda historically was a neutral descriptive term. A wide range of materials and media are used for conveying propaganda messages, which changed as new technologies were invented, including paintings, cartoons, posters, pamphlets, films, radio shows, TV shows, and websites. In contemplating the propaganda I allow in my own life, I’m not even thinking about politics, fake news, and data breaches. I was thinking about the impact of what we read, see, and hear long before the latest fallout with Facebook. For me, at least, the idea of how propaganda in its various forms impacts me and my family was already on my mind and it encompasses far more than the political realm which is what most people think of when they hear the term. It’s much broader than that. Propaganda impacts every part of our life with people who have a message they want to use to persuade us to think and act in a certain way. I wrote a series a few years ago for homeschooling moms called 10 Days of Homeschool Encouragement. One post, in particular, was about choosing your five people carefully. This was based on the popular concept that we become like the people with whom we spend the most time. In that post I mentioned that we have to consider not only the people we spend time with, but the forums we visit, the Facebook groups we are in, the people we text with, the people we spend time with at church, etc. I still firmly believe all of of that, but I’ve come to believe that Facebook as a whole becomes one of those five “people” for most folks who use it regularly whether it is intended or not. People who spend any significant amount of time on Facebook are impacted by it in ways they do not comprehend. I truly believe it becomes one of the most influential “people” in most people’s lives and they aren’t even cognizant of it. In the most amazing and providential way, I feel like I have ended up right back where I started when I began blogging in 2005. Yes, my life is different now in that I have a daughter and we homeschool. We’ve moved. We’ve gone through so many ups and downs with church-related issues. My health has changed. So I am not the same person I was. There is a depth to my life experience that I could not have achieved without the suffering and change. But all of life has led me full-circle back to the concept of two talent living. Of making simplifying choices. Of living a small life. Of being content at home. It’s funny to go back and read the earliest posts on this website because they seem so long ago. Some of them have dated content that I have chosen not to edit out to keep them authentic to when they were written. And yet, at the same time, they are so current. Caroline might not be mentioned in some of them because she wasn’t born. But the core of who I am and what I believe is there. And now it’s like God is circling me back around to take another approach at those same topics but with thirteen years of mothering, marriage, and life to deepen and expand on what I write. I’ve discussed with David that I’m not sorry I went on Facebook for the past few years. I connected with some lovely people from my past and made new friends. Having been on there also gives me a broader view up close and personal as to what is going on culturally. So it was not time wasted. But now it is time to focus on better things both for me and my family. Cal Newport discusses the difference between the social internet and social media. The social internet gives us access to pretty much everything we would want to know as we seek out and find it. I’m profoundly thankful for the internet and what it gives. Yes, it is slightly filtered by Google and other search engines, but the social internet as a whole is primarily free and open. Social media, on the other hand, is by its very nature manipulative and controlling. Social media is driven by algorithms and agendas. Users are the product to be sold to when we use it. I’m profoundly grateful to be breaking free of social media. It’s been two weeks tonight since I deleted my Facebook account so I anticipate I will receive a manipulative email tomorrow. It will tell me to come back because so and so will miss me. It will remind me that I’ll miss such and such. I’m not even half tempted to go back. I truly believe I’ve found something better. Much better. I feel FREE. I feel like I have my life back. I feel like I have my own thoughts back. I told David that people really cannot understand the control Facebook has on their life and thinking unless they walk away from it. I know most people aren’t going to do that and I respect that each person needs to make their own choice. Some people have legitimate needs to use it and I understand that. We each make our own way in the world and we each have to do what we believe is best. But having a true need to use it doesn’t negate the tremendous impact it has on each person who uses it. That is what I wish people would understand. That they are being controlled in ways they do not fully understand. For me, I’m carefully and deliberately choosing the propaganda that will shape my life through the books I read, the bloggers I read, and the other places I spend time. 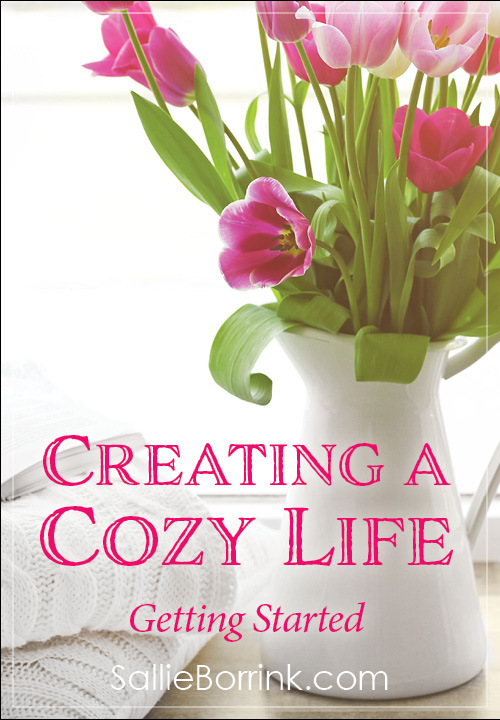 I am seeking out pleasant places in real life that will help me continue to create a cozy life for my family. A life that brings peace, understanding, and joy to my daughter and to my husband. This really resonates with me. Once again, much food for thought. I’ll need to circle back here and follow your links and then give myself time to to think… Thanks Sallie! Nice post, I love old fashion blogs they seem more authentic. Mrs. White has a few books for sell via amazon they are mostly blog posts but I like how they are short reading entries and I love the physical book form. I read from them whenever I need a homemaking “boost”. I removed the facebook app from my phone and kindle. I used to check it multiple times a day and for the few months since its been removed, I only check it weekly, the longer time goes on I don’t post anymore and rarely comment or like anything. I’m sorry your comment got held up. For some reason it went into my comment spam and I just saw it. I apologize for missing it (and another one from someone else). I saw that Mrs. White had several books of her posts. That’s a lovely way to put a collection all in one place. Removing FB from my Kindle was something I did pretty quickly. I don’t like typing that way and prefer a computer. Then off the phone. Then the entire thing. I don’t miss it i at all. I’m glad you found a balance that works for you! I am really pondering this whole idea of leaving Facebook myself.My Facebook has basically become a way for me to post pictures to share with distant family and friends.I am not so sure anymore that I like doing this.I realized last night that my posting is done more on impulse now rather than being thoroughly thought out.I took a nice picture of some of my boys last night and again,I almost instantaneously went to put it on my Facebook wall.But,I stopped myself and just walked away.After a while,I had lost the desire to even share the picture.I have been reading your 30 day summary of leaving.I definitely see that Facebook can create addictive tendencies.I appreciate very much the above article.Once again,you’ve given me much to think on! I’m glad you found these posts thought-provoking. I found myself instinctively doing the same thing this morning when someone sent me an article about a hot topic. My first thought was, “I have to write something about this!” After a few minutes I realized, “No, I don’t.” I might write something in a few days but there is no reason I have to respond right this second. It’s amazing how we are conditioned to do things out of habit. Keep me posted about whatever you decide. I always like hearing about how people make decisions one way or the other. I enjoyed this post very much and agree with you! I choose my five people and my places very carefully, and I’m happy to have done so. I might be “behind the times” a bit but that’s ok. I love my cozy life. Thank you for sharing this on the Simple Homestead blog hop. Thank you for taking the time to leave a comment and let me know you found me via the Simple Homestead hop. I just started participating in that. I’m so glad you found this post enjoyable and affirming. Even if we know we are living the best life for us, it’s always encouraging to find other people who think the same way.